Welcome to the official website of Horses & The Law Publishing. 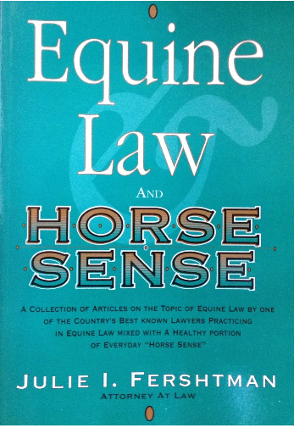 Equine Law & Horse Sense (published in 1996) and MORE Equine Law & Horse Sense (published in 2000) combine general principles of the law with "horse sense" tips to help people avoid legal disputes. The books are meant to be companion books that sell together but can be ordered separately. They cover numerous topics and include no forms. The Law of Negligence - What is It? Equine Activity Liability Laws -- Do They Work? Liability Releases & Waivers -- What Makes Them Fail? 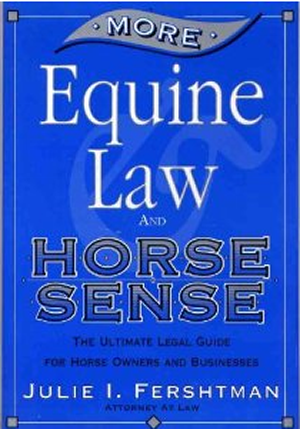 NEW EQUINE LAW BOOK ON THE WAY! 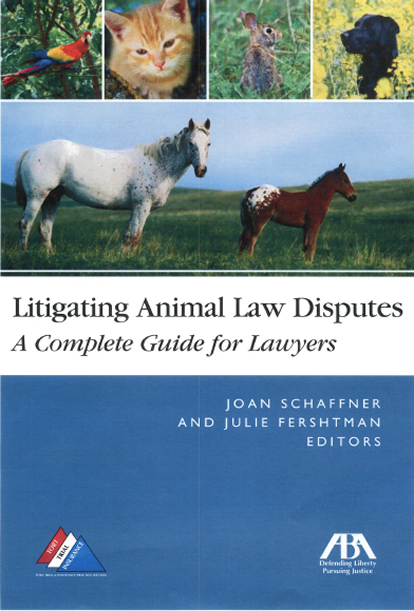 Although the Equine Law & Horse Sense book series has sold out, we are proud to announce that Julie Fershtman's NEWEST book on Equine Law is in progress. The American Bar Association is publishing the book in 2019 or 2020! We'll share details here as the publication date approaches. Julie I. Fershtman, a Shareholder with the law firm Foster Swift Collins & Smith, PC, is among the nation's best-known and most experienced Equine Law practitioners. For more complete biographical information, please visit these websites: www.fershtmanlaw.com, www.equinelaw.net, and www.fosterswift.com. Crossing virtually all equine breeds and disciplines, her law practice serves a national** clientele of stables, professionals, associations, veterinarians, businesses, show management, insurers, trainers, "celebrity clinicians," and individual horse owners. Peer Recognition Among Equine Law Practitioners. She is a Fellow (one of less than 20 nationwide) of the American College of Equine Attorneys. Hard-to-find Equine Law Experience. She has taken Equine Law cases to trial in 4 states and has achieved numerous victories. In one year, she won jury trials in three states (Ohio, Illinois, and Michigan), two appeals, and a major Federal Court insurance coverage case. In addition, she has helped clients avoid legal disputes by drafting a wide variety of equine industry contracts, including waivers/releases, purchase or sales contracts, boarding contracts, training contracts, leases, and numerous other contracts. She has drafted several hundreds of these equine contracts. Equine Industry Service. Her equine industry volunteer work includes service on boards of the American Youth Horse Council and the Equine Land Conservation Resource. She also has served for several years on the Planning Board for the National Conference on Equine Law. Accomplishment and Peer Recognition. A lawyer since 1986, she is listed in The Best Lawyers in America , 2013- 2019 (Categories: Commercial Litigation and Insurance Law) and is rated “AV” [highest rating] by Martindale-Hubbell Law Directory. She was named the 2016 "Woman of the Year" for the State of Michigan by Michigan Lawyers Weekly. The lawyer rating website, AVVO rates her 10.0/10 (highest rating). She has also been named a Michigan "Super Lawyer®" from 2008-2018; from 2013 - 2018, Michigan Super Lawyers® also included her on two of its top lists -- one of "50 Top Women Lawyers in Michigan," and one of Michigan's "Top 25 Women Business Litigators." 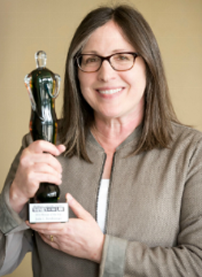 Michigan Lawyers Weekly named her a 2010 "Leader in the Law." She is a graduate of Emory College and Emory Law School. Speaking Engagements - 29 States (and Counting). With speaking engagements that span 29 states, Ms. Fershtman is unquestionably the nation's most sought-after speaker on Equine Law. Her speaking engagements include Equine Affaire (Ohio, Massachusetts, California), Equitana USA, National Conference on Equine Law, Midwest Horse Fair, U.S. Dressage Federation Convention, U.S. Pony Clubs Convention, American Horse Council Convention, American Paint Horse Association Convention, American Morgan Horse Association Convention, Carriage Operators of North America Convention, Hoosier Horse Fair, Michigan Horse Council Expo, national Agribusiness Conferences, and the American Youth Horse Council Convention. In addition, her articles have appeared in over 400 publications and web sites. Visit websites: www.fershtmanlaw.com, www.fosterswift.com, and www.equinelaw.net. Please "LIKE" Our EQUINE LAW Facebook Page! The choice of a lawyer for your legal matter is one that should always be taken seriously and with great care. If you have a legal matter and want to hire Ms. Fershtman, please remember that we must avoid conflicts of interest. Please do not e-mail, mail, fax, or send us details of your potential legal matter. 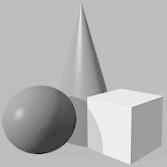 (We might already represent the other side.) Instead, please call Ms. Fershtman's office [Direct line: (248) 785-4731 - Main office line: (248) 539-9900] so that we can carefully evaluate potential conflicts and determine whether our firm is right for your matter. Ms. Fershtman has national expertise on Equine Law matters. She has tried Equine Law cases before juries in four states and has been admitted as special (pro hac vice) counsel on equine lawsuits in 18 jurisdictions across the country. Please understand, however, that ethical restrictions and regulations prevent her from handling cases alone in states other than Michigan, which is her state of licensure. Hiring her on your out-of-state matter will almost always require you to hire a local lawyer to work in some capacity with her.